If you’re a regular reader of the Speaking of Research science blog you will know that we are very interested in neuroscience – in fact several of us are neuroscientists – so you won’t be surprised to learn that we have been following events during Brain Awareness Week (#brainweek on twitter). Brain Awareness Week is a global campaign to increase public awareness of the progress and benefits of brain research that is organized every year by the Dana Foundation in partnership with over 100 research institutes, medical charities and universities around the world. We thought it was a good opportunity to see what new resources on the use of animals in brain research are available from key organizations involved in Brain Awareness Week, and BrainFacts.org – a public information initiative whose launch we reported last May – delivered the goods. Brainfacts.org have been busy since we last reviewed their website, and their pages on animal research in neuroscience have grown into an excellent resource that covers a wide variety of topics including how animal research is planned, undertaken and regulated, and case studies of where animal research has made key contributions to advancing neuroscience. Among the resources are articles written by neuroscientists and excellent videos. The contribution of animal research to brain research has been highlighted by several recent media reports of important advances in brain science. These have ranged from a study in mice that demonstrated that high salt intake can increase the activity of a class or immune cells known as Th17 cells that have been implicated in the early development autoimmune disorders such as Multiple Sclerosis, to a study that showed how brain implants could enable rats to sense infra red light with great potential for the development of sensory prosthetics to complement recent advances on the control of robotic limbs, to the identification in rats of a protein that plays a key role in enabling some brain cells to survive following a stroke and may lead to new therapies. Today there was another great piece of research (1) to report as a team of stem cell researchers at UW Madison led by Professor Su-Chun Zhang and Professor Marina Emborg chalked up another first, demonstrating for the first time that it is possible to transplant neurons generated using iPS cell techniques from a monkey’s own skin cells into their brain, where they develop into several types of mature brain cell. The success of this study is enormously promising for the future of personalized stem cell therapies for Parkinson’s disease, stroke and other brain disorders, as the report in the University of Wisconsin Madison News makes clear. 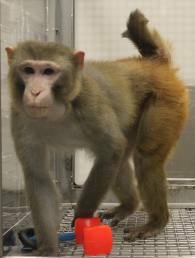 Because the cells were derived from adult cells in each monkey’s skin, the experiment is a proof-of-principle for the concept of personalized medicine, where treatments are designed for each individual. 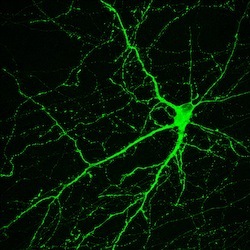 This neuron, created in the Su-Chun Zhang lab at the University of Wisconsin–Madison, makes dopamine, a neurotransmitter involved in normal movement. The cell originated in an induced pluripotent stem cell, which derive from adult tissues. Similar neurons survived and integrated normally after transplant into monkey brains—as a proof of principle that personalized medicine may one day treat Parkinson’s disease. It’s interesting to note that the development of green fluorescent protein (GFP) labelling that played a crucial role in allowing Profs. 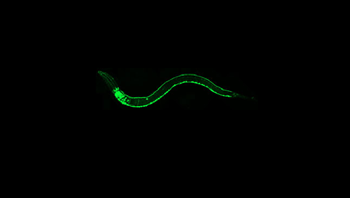 Zhang and Emborg’s team to distinguish transplanted cells from host cells in the monkey brain was made possible by research in the nematode worm Caenorhabditis elegans , a tiny worm that itself plays a perhaps surprisingly important role neuroscience. These discoveries and advances impact on many areas of brain research, and have the potential to benefit those suffering from a wide variety of brain diseases and injuries, so it is fitting that in Brain Awareness week we salute the researchers whose ingenuity and hard work makes them possible. Posted on March 14, 2013 March 15, 2013 by EditorPosted in NewsTagged animal research, brain, monkey, neuroscience, Parkinson's Disease, worm. Reblogged this on disce aut discede!.